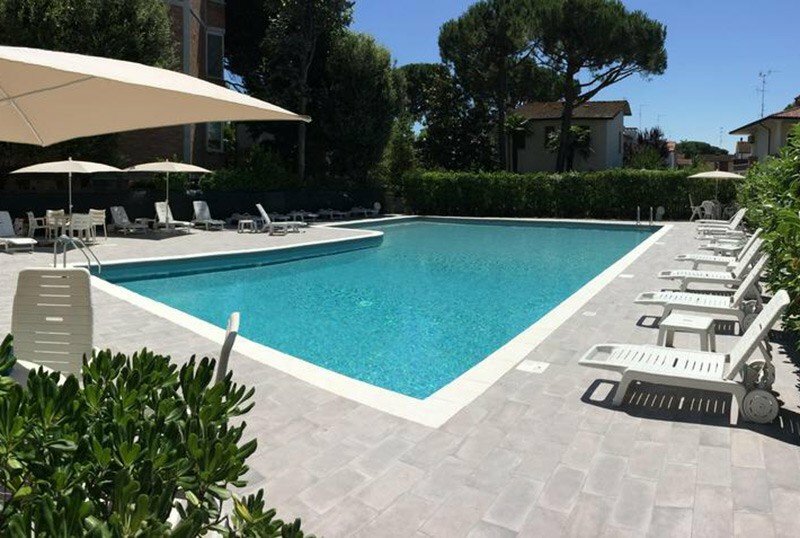 The 3-star Hotel Dafne in Punta Marina Terme is a family-run hotel with a large swimming pool with hydromassage area and solarium, private parking, free use bicycles, WI-FI and an excellent cuisine managed directly by the owner. Special attention is given to families with children, to whom services and accessories are dedicated: high chairs, cots or bed rails, baby menus and flexible hours at the restaurant. Admits small pets. The hotel is located in a central but quiet area, surrounded by greenery, near the sea and the pine grove of Punta Marina. Nearby the bus stop, which connects the area to Mirabilandia, Marina di Ravenna, Milano Marittima, Cervia, Ravenna, Comacchio and the Po Delta Wildlife Park. The rooms have a balcony (in the large rooms), flat screen TV with digital terrestrial, air conditioning, telephone, safe, WI-FI, private bathroom with shower or shower curtain, hairdryer and complimentary toiletries. You can choose between various types of rooms: double, triple, quadruple or connecting rooms. All rooms can be reached by elevator. FAMILIES: there are family and connecting rooms. Swimming pool with lower area for children and hydromassage, solarium, garden, open-air porch, terrace, bike and mountain bike rental for a fee, hall with satellite TV and Sky, bar, elevator, reading room, conference room with 40 seats, newspapers. It is equipped for cyclists. PARKING: uncovered and free, available to all customers. WI-FI: available and free throughout the entire hotel. AIR CONDITIONING: also present in the room. CONVENTIONS: beach, spa, waterslide, Inail / Inps, law enforcement. Discounted tickets and passes are available for Mirabilandia and agreements with amusement parks. SERVICES FOR PEOPLE WITH DISABILITIES: entrance and ground floor room, room with wheelchair maneuver space, wheelchair access shower. BREAKFAST: international buffet breakfast with sweet and savory dishes. LUNCH AND DINNER: the kitchen of the hotel is particularly cared for and managed directly by the owner who combines typical dishes of Romagna, such as homemade pasta or piadina, with traditional Italian dishes. Every day you can choose between 3 menus with rich first and second fish or meat. Pasta and desserts are homemade. VARIATIONS: on request gluten-free menus, vegetarian or for those who follow particular diets are available. In the hotel: children's pool, outdoor playground area. At meals: baby menu, baby food, high chairs, cutlery, bottle warmer. Flexible hours with meals. The hotel has a swimming pool with hydromassage area and an area with shallow water for children. It is surrounded by a large solarium area equipped with sun loungers and WI-FI areas. 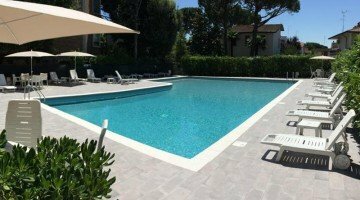 The hotel has an agreement with Bagno Bologna, Bolognino and Chicco Beach. These establishments are equipped with spaces, services and entertainment for children. Prices for full board and half board are per person per day for a minimum stay. 3 days. TOURIST TAX: excluded. € 2.00 per person per day for a maximum of 7 consecutive nights, excluding children under 14 years. - A deposit will be requested upon confirmation of booking. - In case of cancellation, the deposit can be used for an upcoming stay in the same year. - In case of early departure, the customer is required to pay a penalty of three nights. Child FREE in the room with 2 adults for a minimum stay of 6 days. As per Special Offer "SEPTEMBER SEA AND THERMAL BATHROOMS IN ALL INCLUSIVE: FREE CHILD"
The Dafne hotel in Punta Marina Terme, 250 meters from the sea, is 15 minutes from Ravenna., A city of art rich in culture and wonderful Byzantine monuments, UNESCO heritage, easily reachable from the hotel by bus (stop at 100 m). Leaving the car in the hotel car park. The Dafne hotel awaits you in a familiar and simple environment, ready to meet the needs of the smallest and attentive to the needs of the largest. A lot of attention to make you feel at home.